The importance of an attractive, friendly and stimulating learning environment for student performance and wellbeing, in general, is widely documented but schools and universities don't always embrace this concept. There are lots of different reasons for this, not least of which is the lack of funds or different priorities for their investments. But in Montreal, we've found a really virtuous example of this approach. Cégep Marie-Victorin, a public college in north-eastern Montreal with more than 4,000 students has rolled out a number of large-scale development projects since 2008, all with the intention of upgrading their learning environment. Bolstered also by their educational offer with a wide range of programmes, some of which are artistic in nature - graphic design, interior design visual arts - the college boldly drew on its own resources and in 2017-2018 a team of professional experts and creative students worked together on three renovation and design projects. The work targeted the pool, locker rooms and gym and the goal was to create a well-defined sports environment, complying with environmental, structural and functional regulations for the swimming pool, and at the same time ensuring that it would meet the various needs of the student community and the general public, for the locker rooms and gym. The standout features of the swimming pool are the oversized swimmer printed on the walls and the large windows facing onto the pool. This is more than just an aesthetic choice; it's also a creative and efficient way of filtering daylight and reducing the amount of light that reflects in the water, drawing attention to the sheer size of the space and making it more comfortable for users. The redesign of the locker rooms was based on three themes: flexibility, organisation and functionality. Mobile panels are used to make the spaces as flexible as possible, turning them into one, two or three locker rooms, as required. What's more, two large windows give views onto both the gym and the swimming pool, thereby making the locker rooms the focal point of the sports centre. 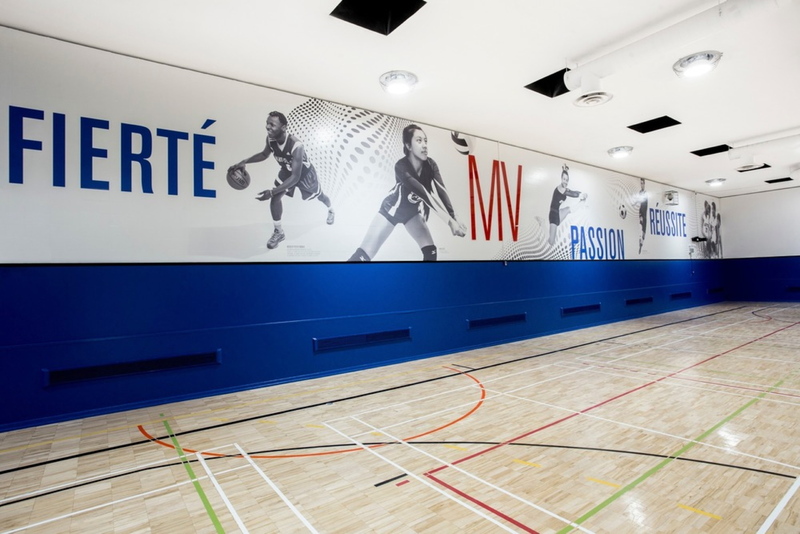 In the gym, the main wall is covered in printed images of Cégep Marie-Victorin athletes, lit by both carefully selected lighting fixtures and by the daylight filtering through from the swimming pool entrance. The gym has become a space that showcases the talent of some of the athletes, and also promotes sports at the university. The effect is spectacular, and it immediately makes visitors aware of how important sport is to the institution as well as being a tribute to the athletes themselves. The project also focused on really bold graphic signage in the transition areas (stairs, hallways, mezzanines) making it easy for people to find their way from one space to the next.